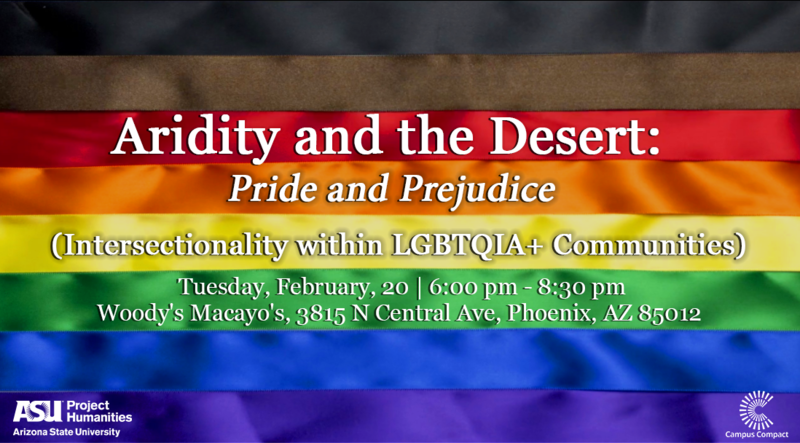 “Aridity and the Desert” is an event that engages diverse populations in critical dialogue around tough subjects that might otherwise remain unapproached because people have been taught to avoid such contentious topics in public conversation. 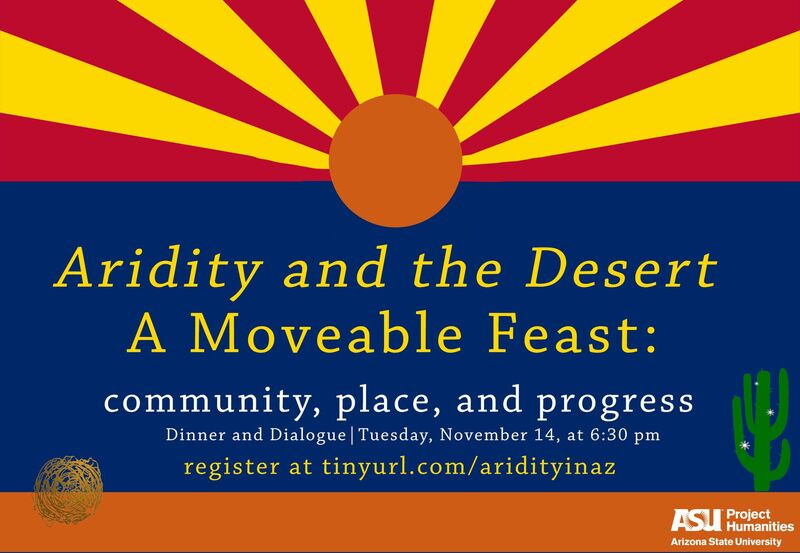 The “Aridity and the Desert” Dinner and Dialogue series facilitates conversations in everything from morality, politics and politicians, and LGBTQ issues to the future of technology and humanity. While individuals may not agree on perspectives, being aware of other perspectives and respecting civilly and respectfully is a skill on which all can improve. Through structured, civil, facilitated discussions, the “Aridity and the Desert” series doesn’t necessarily intend to resolve tension between people with opposing views, but rather to create a space in which individuals with different life experiences and perspectives can talk freely, openly, and respectfully. These events take place at the dinner table, following the belief that “breaking bread” serves as a cultural ritual through which we can see others as real human beings. The hospitable environment helps people with opposing views communicate more openly with one another without feeling like they are under attack. Even if they are unable to reach consensus or resolve their differences, they will have at least had the opportunity to engage in respectful dialogue and better understand the perspectives of others. Click here for the full event series report. ASU Project Humanities, with funding from Campus Compact, has launched a new community engagement series that focuses on place and identity, “Aridity and the Desert.” Such a series builds upon the connections Project Humanities has with various communities inside and beyond ASU. Throughout 2017 and 2018, Project Humanities with engage diverse individuals and communities in “talking, listening and connecting” to build bridges that promote civil dialogue and engagement and demonstrate the power of our shared humanity. When I meet new arrivals, I ask what brought them to the desert. Some say a job transfer, some family matters, some came for college or the Air Force, others for lower taxes in their retirement years. When people want a change they paint their living room or find a new job. They don’t pack up a car and drive to a land of dirt and dust and rocks and endless miles between interstate restroom stops. I don’t press them for why they really came, because I already know. These are the people who are drawn here because they are survivors. This place welcomes kindred souls who identify with the land’s fragility and harshness. From the desert scrub that comes to back to life every year to the early farmers who toiled more than 4000 years ago Casa Grande , this land has always been a home of survivors. * Written by Theresa Shaw, Chandler, Arizona, for the inaugural "Aridity and the Desert" on November 14, 2017. Video of Aridity And The Desert - What is Caliche? 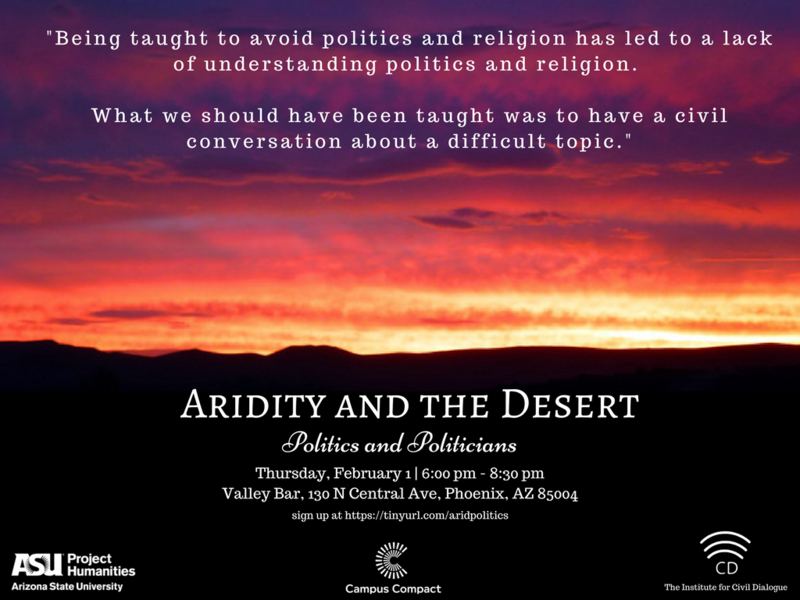 This second installment of our Campus Compact funded "Aridity and the Desert: Politics and Politicians" continues with these questions: Do we lose our humanity when elected as public servants? Are politicians willing to say and do anything to win an election? Are elections more about parties and political affiliations than an individual's morals and moralities? Is the personal always political? Is the political always personal? This Dinner and Dialogue series will further uses narrative and storytelling to explore the unique place of Arizona in national political conversations about education, healthcare, immigration, and borders. It's hard enough being queer, some would argue, but being a queer person of color, queer and undocumented, or queer and in poverty are experiences that rarely come front and center in mainstream public and political discourse. Our third in the Campus Compact-funded 'Dinner and Dialogue' series looks at potential causes for tensions, biases, and violence in an effort to raise awareness and to create better allyships support, and understanding. This final 'Dinner and Dialogue' will look at the race to innovate and create the next best technology and the extent to which creation and innovation do not always center our individual and shared humanity. We will explore these questions: Why and how are science and technology presumed neutral and disconnected from identity politics? Who Innovates? Who's left behind? Who benefits?.